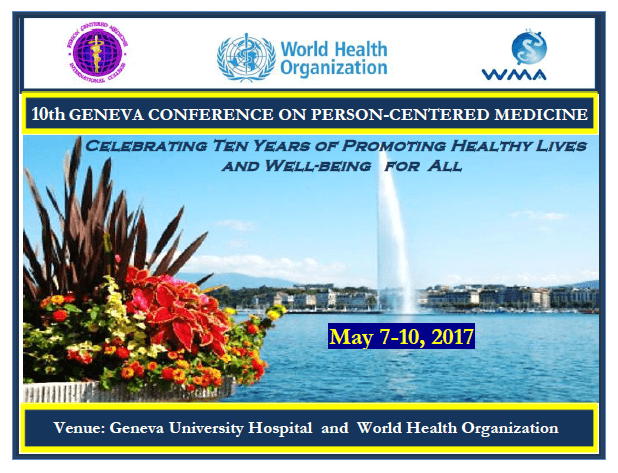 10TH GENEVA CONFERENCE ON PERSON-CENTERED MEDICINE | SOCIETY OF PREVENTIVE PSYCHIATRY - WFMH, WASP MEMBER AND WPA AFFILIATE MEMBER. ΕΤΑΙΡΕΙΑ ΠΡΟΛΗΠΤΙΚΗΣ ΨΥΧΙΑΤΡΙΚΗΣ - WFMH, WASP ΜΕΛΟΣ ΚΑΙ WPA ΣΥΝΔΕΔΕΜΕΝΟ ΜΕΛΟΣ. I would like to announce to you the organizing of the 10th annual Geneva Conference on Person-centered Medicine to be held at the University of Geneva in collaboration with the WHO. These scientific conferences are always of prime importance and this year’s conference coincides with the tenth anniversary since the establishment of the International College of Person-centered Medicine. Please find attached the program of the conference, as well as all participation documents (registration and abstract forms) in case you decide to participate! I urge you to do so!